On July 7. 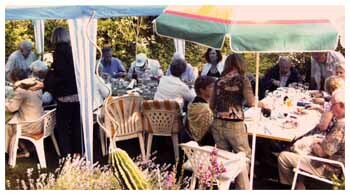 2012 the luckier members of the Austro Brits Tyrol accepted the invitation for the famous Garden Party from Hazel and Elmar at Birga. Hohe Birga: not too many people have heard this name in connection with excavations. But those excavations showed that people were living here since the faroff days of the Stone Age. Nowadays we, as amateurs, were able to recognise the stone base of several houses on a strategically important hill.We could have seen even more in a tiny museum, but this is still closed to the public. In the meantime, Elmar had prepared a wonderful barbecue and the smell of grilled meat and sausages was in the air and I think that everybody felt hungry. The Grillmaster was undoubtedly Elmar, but there was not only meat on the table: members brought a broad selection of delicious salads. Thus everyone enjoyed the meal and had beer, wine or non-alcoholic beverages, a glass or maybe a little bit more, not to forget the opportunity of chatting with friends under a sun roof. This roof was erected by Heinz and it served well as a rain roof too. And there really was a need for rain protection because of a short rain shower, but this did not hinder all the chatting and joking and, after a short time, the sun sent her beams once more. So a wonderful evening went on and we did not say good bye to our generous hosts until darkness made significant progress. Many thanks to Hazel and Elmar.